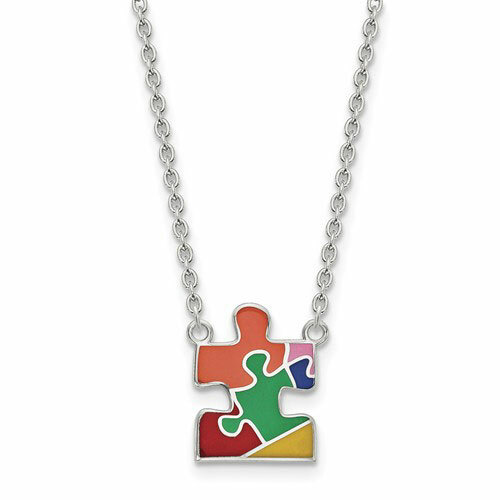 A colorful, sterling silver autism awareness puzzle necklace in 18" from Apples of Gold Jewelry. The silver puzzle pendant measures 3/4" tall x just under 11/16" wide. Also available as a stand alone pendant, shown below. Includes a .925 sterling silver cable chain with lobster claw clasp. The pendant and necklace weigh approx. 4.92 grams of .925 sterling silver. We guarantee our Sterling Silver Enameled Autism Awareness Puzzle Necklace to be high quality, authentic jewelry, as described above.